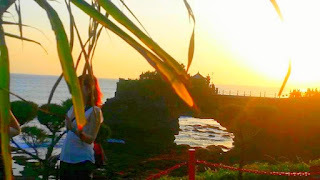 People who have a vacation in Bali must know Tanah Lot, a very famous tourist attraction with a very beautiful sunset. Tanah Lot is located in Tabanan, with a view of the temple on a large rock in the middle of the sea, with a stunning sunset during the afternoon. Tanah Lot in Tabanan, Bali, has a unique story in the process of beginning a temple made it hundreds of years ago. Temple built on a large rock in the middle of the sea with a variety of unique surroundings. The uniqueness and the magic that is in Tanah Lot is very difficult to count and understand common sense. One of them is the fresh water continues to flow endlessly from under the temple. Rattlesnake never killed even though touched by a lot of people, stones are not destroyed despite continuously hit the sea waves. And other oddities that are difficult to think with common sense, all can be seen graphically in Tanah Lot in Tabanan, Bali. 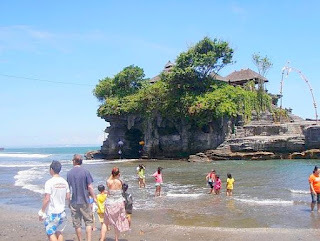 Attractions Tanah Lot in Tabanan, Bali, is a view of the temple with a very large ocean waves in the vicinity. Being in between the rocks with complicated shapes but interesting to see. In the west there is a rocky outcrop overlooking the sea with a large hole in the bottom, and a small temple on top of the hole. Very nice to see the sun set in stone. Attractions of Pura Tanah Lot is one of the most searched by tourists from various countries who were on vacation to Bali. This attraction is very beautiful and fun to be enjoyed during the afternoon. Sunset view during the afternoon makes this place into the most popular places in Bali to visit. With a cluster of rocks and huge sea waves, making Tanah Lot Bali is very beautiful to look at from all directions. However, did you know that Tanah Lot in Tabanan, Bali is a very dangerous place, although it has been visited by millions of people every year !. With the natural conditions around Tanah Lot, can be clearly seen that this place is very dangerous. Large sea waves sometimes appear unexpectedly. In fact, many people died in Tanah Lot Bali. Foreign tourists, local tourists, local residents, children, adolescents, adults, there are a lot of people died in this place. Most of the bodies of the dead have not been found to date. Because the bodies of the men were dragged sea water up to the middle of the sea. The quest of those who died in Tanah Lot has been done, but the majority have not been found until now. Terrible sea conditions very difficult for the search process. Very large ocean waves, dangerous rocks, the ocean currents are very strong, making the search process very difficult. The sea and the beach at Tanah Lot is very dangerous to explore further. 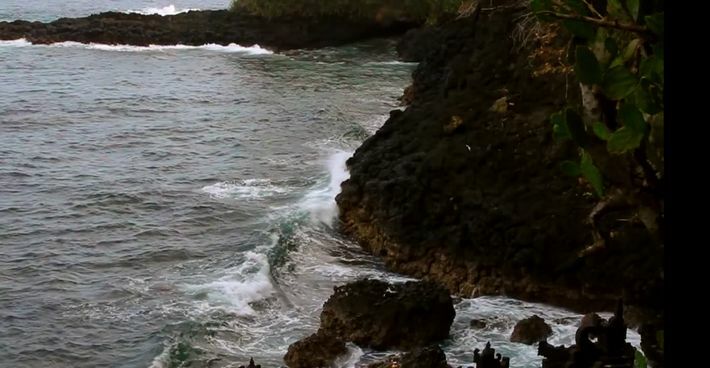 Big waves, strong ocean currents, large rocks, make Tanah Lot is very dangerous. The beauty of the deadly very appropriate for this attraction. Most of those who died in Tanah Lot is because they do not pay attention to and comply with all instructions and warning signs of danger are posted in the area of Tanah Lot. The management has put a lot of warning signs of danger in the region, but many of them do not care about the warning. Therefore, every tourist should adhere to and pay attention to all the restrictions that exist.